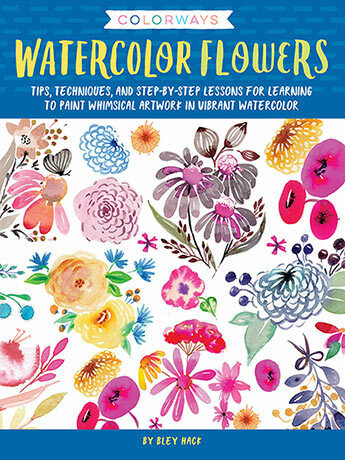 Watercolor Flowers (Colorways) teaches artists of all skill levels how to paint harmonious, vibrant, and colorful renditions of flora from all around the world. Watercolor Flowers (Colorways) teaches artists of all skill levels how to paint harmonious, vibrant, and colorful renditions of flora from all around the world. Calling all aspiring artists! Grab your paints because its time to explore key watercolor techniques, including washes, gradations, painting wet-into-wet, glazing, and understanding the color wheel to create harmony in a piece of art. WithWatercolor Flowers (Colorways), you will create vibrant and colorful floral paintings while mastering how to use color for maximum effect. You also learn where to find artistic inspiration, how to become a “visual collector,” and how to add fauna to your floral paintings. Colorways is a brand-new series from Walter Foster that teaches artists of all skill levels how to create innovative, inspired artwork full of color and imagination. Focusing on creating expressive pieces over realistic scenes, Colorways shows artists how to break the 'rules' of color and let their imaginations and artwork soar to new heights.